﻿ How to Double The Size of Your Email List in 3 Months, Part 2 » Red Mango Marketing! « Are You Losing Money by Missing Out On Mobile? Ready to keep growing that email list? In my last post, I introduced you to the wonders of web pop-up forms — which will consistently deliver quality leads to your business. Today, I’m diving into another strategy. Something you can use to really accelerate your list growth. Giveaways draw a crowd. Usually a crowd that’s happy to hand over an email address for the chance to win a prize. In the past few months I’ve run multiple email capture sweepstakes, some attracting as many as 20,000 new email subscribers. Make your giveaway something that’s relevant to your business. If possible, give away one of your business’s best-selling items so that you know it will be attractive to a large group of people. My advice is don’t skimp on the giveaway. The more exciting the prize, the more signups you will get, which should return your investment pretty quickly. Make your sweepstakes easy to enter by asking for limited information. Usually name and email is all you need. If you have a storefront, you can have a business card drawing. But to reach a larger audience, you’ll need to create a simple landing page. 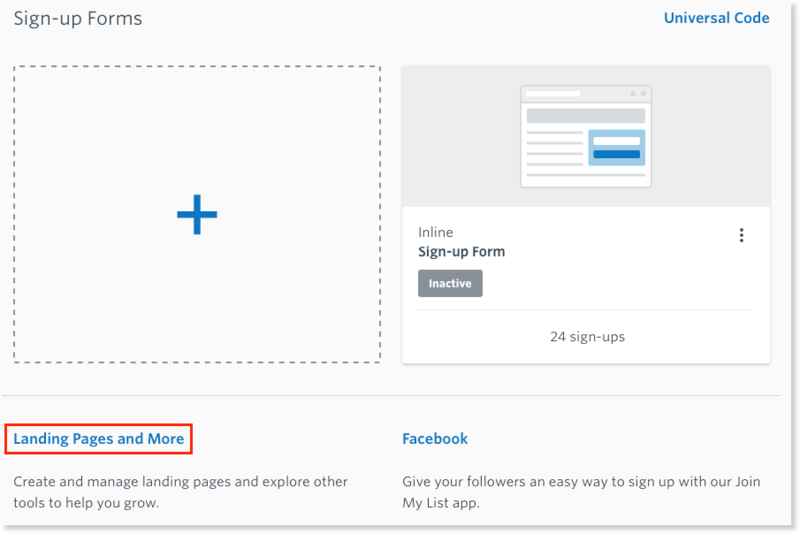 You can create a basic landing page in your Constant Contact account, within the “Sign Up Forms” tab. If you want to create something more advanced, Constant Contact’s integration partners like LeadPages and Unbounce give you access to beautiful landing page templates and advanced features like A/B testing, so you can optimize your page for higher conversion. Once you have a landing page, promote through your usual online channels, including your website and social media accounts. You can also promote the giveaway at an event or your place of business. For even greater success, consider partnering with like-minded businesses. I tested this strategy this past fall at PicoBrew with the goal of growing their email list in time for the busy holiday season. 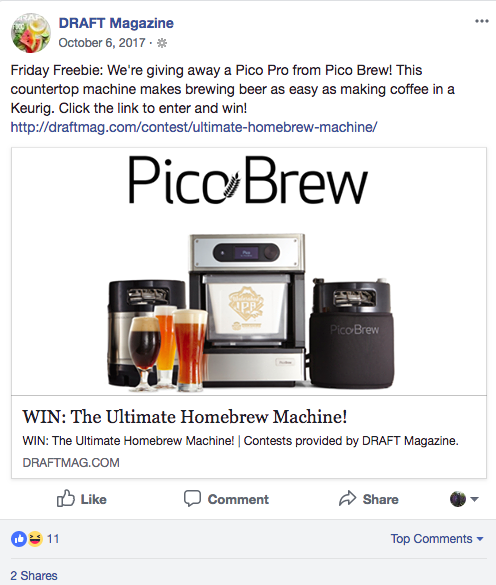 By partnering with DRAFT Magazine, their giveaway reached a relevant audience of beer lovers — including many people who had never heard of PicoBrew before. This partnership was a paid promotion, but I’m willing to bet you could find some businesses in your community that would be willing to partner with you for free. Think about friendly non-competitive businesses in your community that have an active following and relevant audience that would appreciate your product or service. Then, ask a handful of business owners if they’d be willing to share a quick social media post with their audience. It never hurts to say that you’ll return the favor! You probably want to make your sweepstakes last between one and four weeks before choosing a winner. Follow up with your winner separately and smooth out all the fulfillment details. Then, take this opportunity to make everyone on your list feel like a winner. Typically I do this by offering all new subscribers a special deal like 15% off their next order. Use this follow-up to reinforce the value of being a part of your email list to minimize unsubscribes. Sometimes you have to give a little to get a little. But with the right giveaway, you can give a little to get a lot. Start today by deciding what your business can use for a sweepstakes prize. Then, hop into your Constant Contact account to create your sweepstakes landing page. 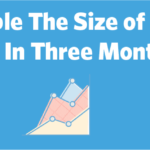 The post How to Double The Size of Your Email List in 3 Months, Part 2 appeared first on Constant Contact Blogs. This entry was posted on Monday, April 16th, 2018 at 8:00 am	and is filed under Email Marketing, List Growth, News & Updates. You can follow any responses to this entry through the RSS 2.0 feed. Both comments and pings are currently closed.